For my graduation present, my parents got me a nice little starter watch from Ball to replace my aging Fossil which I accidentally tore the crown off of whilst putting a jacket. 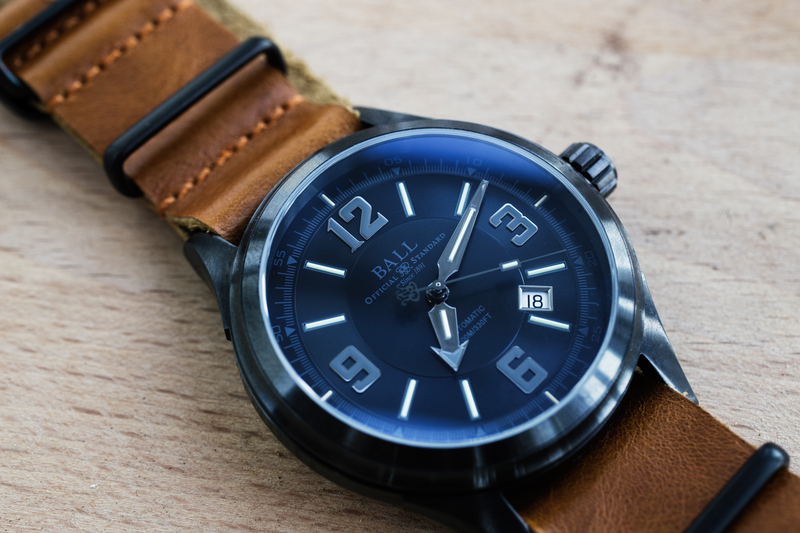 This is the Fireman Racer DLC from the Ball Watch company. I was pleasantly surprised that my parents got me this watch when I was expecting something like a Seiko or Hamilton. Ball Watch is by no means on the level Rolex, Omega or even Bell & Ross but ideally that is something that I would want to get on my own when I’m more established. Ball is definitely a big step up from Hamilton, Orient, Seiko, Lum-Tec etc though, so for that, I appreciate my parent’s choice. 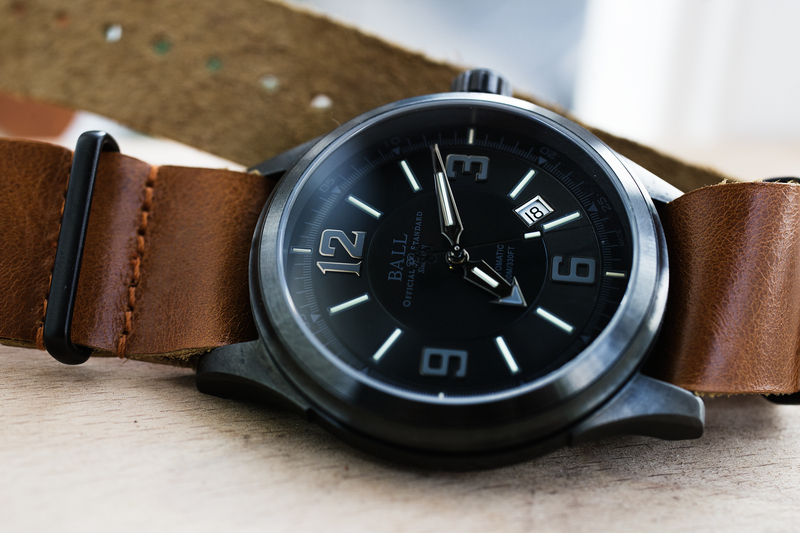 Although I’m not a huge fan of some of Ball Company’s watches, there are some very beautiful lines within the brand such as the Green Beret Engineer Master and the Skin Diver. The Fireman series fall into their sportier category of watches which are not necessarily tool watches or watches that have functional bezels or stop watch functions, but rugged nonetheless. Most of the Fireman series are rather old fashioned looking but the Fireman Racer is definitely a very youthful looking watch with certain stealthy elements such as a black dial, muted numerals and hands and a DLC (Diamond Like Coating) on the case which gives it a dark gunmetal gray look. Overall, it’s very cool! The DLC coating is very strong and gives the case the durability it needs to be a sporty watch. This watch is immune to most bangs and drops. The flat sapphire crystal helps with dial visibility straight on and with scratch proofing, although its high reflectivity makes it a bit difficult to read from certain angles. It lacks the anti-reflective coatings found in higher watches in the $2000-$5,000 range. The crown is screw-in and easy to operate and most importantly sturdy. It has snagged a couple times whilst I was putting a jacket on but was sturdy enough to not feel like it was going to easily dislocate. The movement is a Swiss ETA 2824 self winding movement that is not in-house for Ball. I believe Ball tweaks the movement a little bit to their anti-shock specs, but that’s about it. Ball does not manufacture their own movements. At this point, I don’t really care for in house movements or officially certified “chronometers” because that will just push up the cost of production and the price of the watch for me. From what I can tell, the movement inside the Fireman Racer DLC keeps time very well by +/- 3 seconds a day. The watch comes standard with a black stitched rubber strap but I felt that there was just way too much black or stealth going on. I’m not a Navy SEAL or tactical dude so I felt no need for the lack of contrast. I opted for a simple rich brown leather nato strap which contrasts nicely with the dark gray case. I think it’s a wonderful look. The strap itself is very low quality and thin, but it’ll do for now. I really had to get that black rubber strap off because it was killing the watch’s personality. I’m currently waiting on a thicker sand colored strap from Bas and Loks, which will hopefully arrive soon! Some people dislike the white date window against a dark dial but I really can’t agree. It’s not that distracting and the date dial is very easy to read at a glance when writing checks and filling out forms. I know a black date dial with white markers would not be as legible despite what everyone seems to argue. Overall, the watch is very handsome. It features a 2 day power reserve, a high amount of shock resistance due to Ball’s proprietary Spring Lock technology which houses the balance spring in a cage of sorts to reduce shocks by 66%. I have no idea how affective that really is, but sure why not! The back is equally pleasing to look at with a carving of a train in relief. 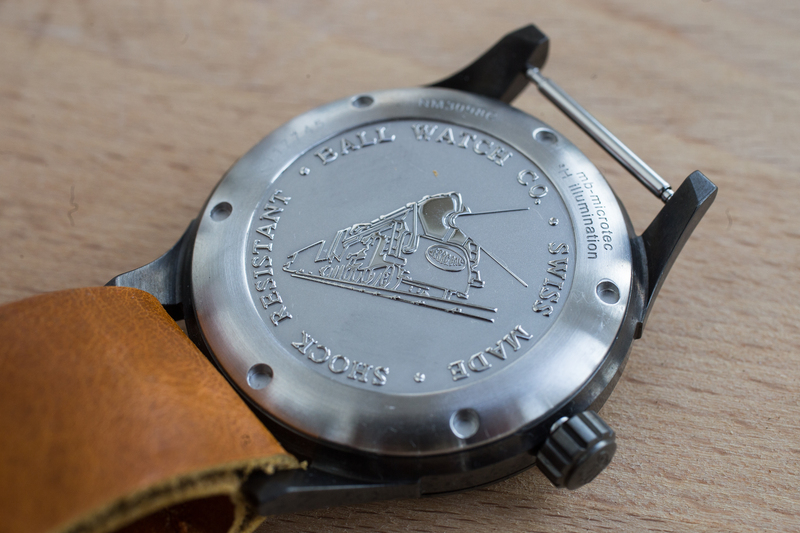 Ball Watches history started off as being the official time keeper of the rail roads in the 1800s. The case back also tells us some of the features of the watch. It’s water resistant up to 100 meters/330 feet so you can easily take this to the pool or to the ocean swimming and snorkeling. I would not use it for scuba diving even though it’s waterproof to 330ft, because it lacks a rotating time keeping bezel that keeps track of how much air you have in the tanks. 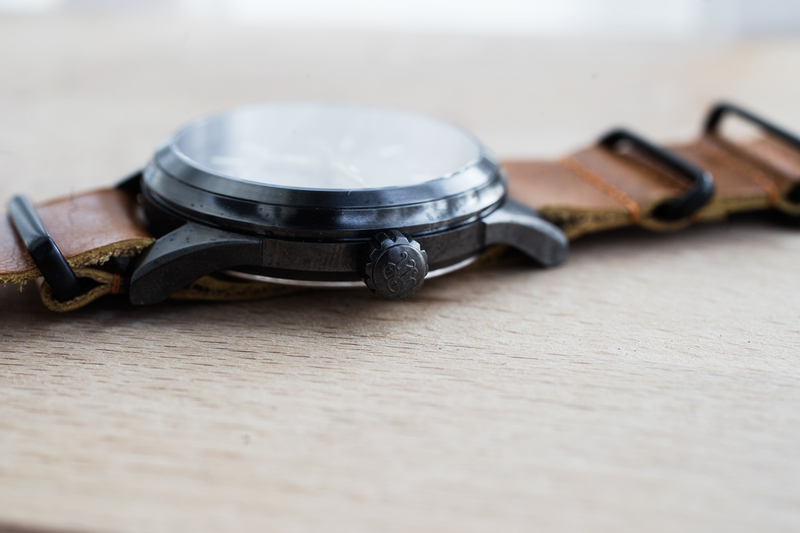 The watch is relatively light on hands and overall, just very enjoyable to wear. It makes a great starter watch in the mid tier range. I’d say the most interesting thing about Ball Watches is its lume technology. 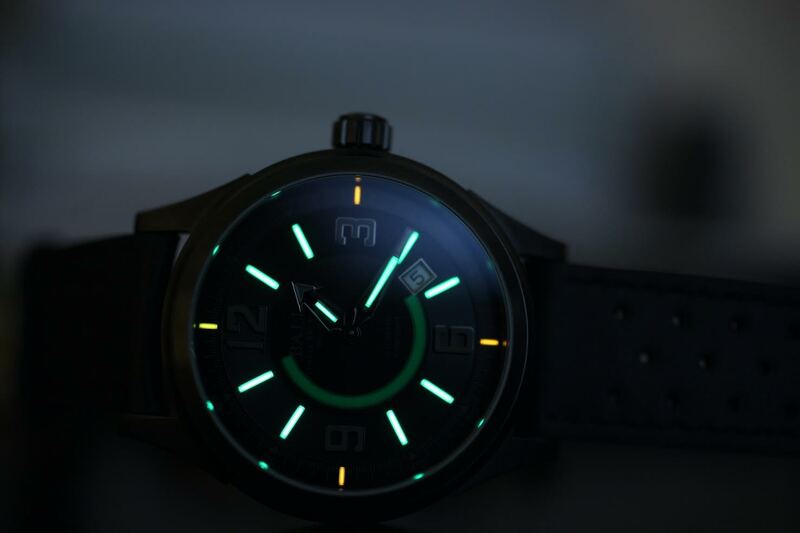 To help tell time at night, this watch has 15 tritium gas filled tubes that glow at all times of the day. It’s not like super luminova paint that needs to be charged by a light in order to glow. The miniatures gas tubes in the Ball Fireman Racer DLC and all other Ball watches emit a steady glow that, although not as bright as a just-charged super luminova watch, will continue to glow evenly throughout the rest of the night whereas a super luminova watch will lose its visibility after 1 hour. The gas tubes do lose their brightness extremely slowly over time (25 years as Ball says) so they will eventually need replacing from Ball. For a reasonable rate, of course.